I hope you are reading all the good news from Gaia Portal. It will combat any fear, as societal shakeups during the next several months may look bad. 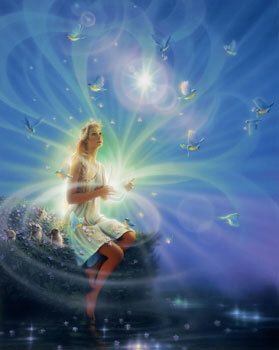 Gaia Portal reassures that all is well and only getting better. We are creating the New Earth fields of green. Serenity of silence engenders fields of green. Green is the color of healing. Coincidentally (?) it’s the color of Earth, along with serene blues. Getting quiet, “going within”, brings peace to oneself. Imaging a desired future, one of ease and beauty, like fields of green, brings it into one’s personal reality and to our shared reality of New Earth. Another aspect of this is the quieting of much warring on the planet. In war-torn areas, people feel the return of peace and silence. They feel it inside themselves and are able to participate in engendering fields of green—green of healing and green of Earth. Caresses of higher vibrations consoles the awakened. The grand Awakening of humans on Earth has two major veins: awakening to how controlled and manipulated, brainwashed, lied to, and limited we have been; and awakening spiritually to realization of who we are, loosening the mental limitations we’ve put on our Consciousness and our abilities to use it. Most of us go through some levels of outrage, regret, and sorrow at those realizations. Spiritual awakening may involve spontaneous extrasensory abilities, some of which may be disturbing or disruptive to normal activities. Intuition can no longer be ignored, as it blossoms to “just knowing” things without rational reason to know. Some people begin to heal others, with a touch, a look, a thought. The metamorphosis of awakening along both veins requires many adjustments. Though it’s all good, regular life is upset. Gaia is now of a higher energetic vibration than we had in 3D. The vibrations of humans and Hue-Mans are rising. Some people are of higher frequency than others, at this point. For some it’s an uneven up and down of vibration, like you see on a stock market chart, especially as we witness economic and political instability. We can use some consolation, and feeling the higher vibrations will do that for us. We can use the Serenity of Silence to gain that consolation. Sitting on the porch, seeking natural beauty and peace, or walking brings it. Enjoying the Love of family, friends, and wider circles of people and all Beings around us brings it. Multitudes of Beings are focused on supporting our global ascension. We are each personally known and helped by Beings in higher realms, whether or not we’ve asked for it. They are soothing us, because it’s what we need now. Jerry’s recent post, Archangel Raphael: “Yes, You Are Receiving My Help”, shows that we can ask for and receive confirmation of their help. Begin to see the Magic of reality and you will notice it. Fortification of nutrients occurs within the Gaia collective. Using the metaphor of “fields of green”, the lushness of New Earth is fertilized by all the qualities of the dynamic energetic configurations of Earth. Energies and Beings that awaken, assist and provide consolation to us are the necessary nutrients that fortify us. Hellenics, both enslavers and slaves, of Earth awaken to the New Light. That is the combined spectrum pure white Light that purifies, that brings the hidden to light, the Light of knowledge and wisdom, that awakens us to what has been and what may now be. Controllers awaken to our equality. Remorse and Love awakens in them. Slaves awaken to their status of being willing slaves. Forgiveness, Self-Responsibility and Love awakens in them. The First Wave of Ascension included a third of humanity. Now, the Second Wave of Ascension is in process. We’re used to the normal 3D levels of five senses. Extra-sensory perception (ESP) was undeveloped, even debunked by the liars. People are beginning to increase the levels of the five senses and to develop inner senses that I’ll talk about later. Some New Earth features are the new senses mentioned earlier, as well as what is illumined by those new senses. Another type of protrusion is the New Earth way of doing things. The transparency in banking; economies that include all people, rather than some climbing on the backs of others; honesty and clear intent to assist fellow Earth Beings—those are some features of New Earth that are behind big changes that will occur in 2016. Gatekeepers are those awakened ones who bridge regular humans to the higher densities. Those drawn to have and experience higher vibrational frequencies (more positive, loving, emotionally clear, etc.) are the Elicitations. They are then in a state where the light work of gatekeepers can adjust their energies so they can go through the portal to the higher level.